The Olive Woolly Bugger, weighted, is a good searching pattern, it suggests a wide variety food to the trout. It might be termed big "yummies" and often the number one early season fly for most lakes. It looks so edible to the fish, it consistently fools trout, bass, Salmon, pike and walleyes. The ageless Woolly Bugger's effectiveness in bringing fish to the net is due to it's ability to imitate so many of the various food morsels on which fish feed. Thread : Olive or black. Tail : Olive marabou and 2/3 strands of pearl flashabuo. Hackle : Palmered olive genetic hackle. 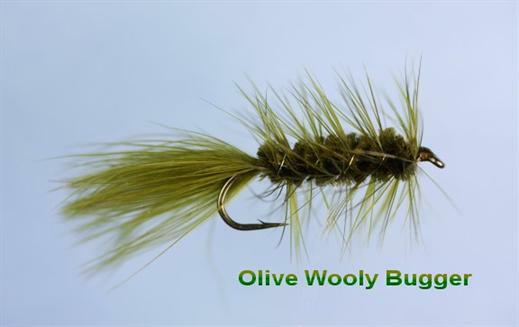 Currently there are no comments about the Olive Woolly Bugger fly pattern from other fly fishermen yet.